One afternoon in the middle of February I was hard at work on the novel*, feeling the push to “get it done.” For many years I’d been telling myself the story that “I can’t finish anything, I can’t complete things I start. Something always gets in the way…” blah, blah, blah, etc, etc. Having just had a miscarriage two months prior this feeling of incompletion was heightened and thus the drive to finish the book potent and strong. 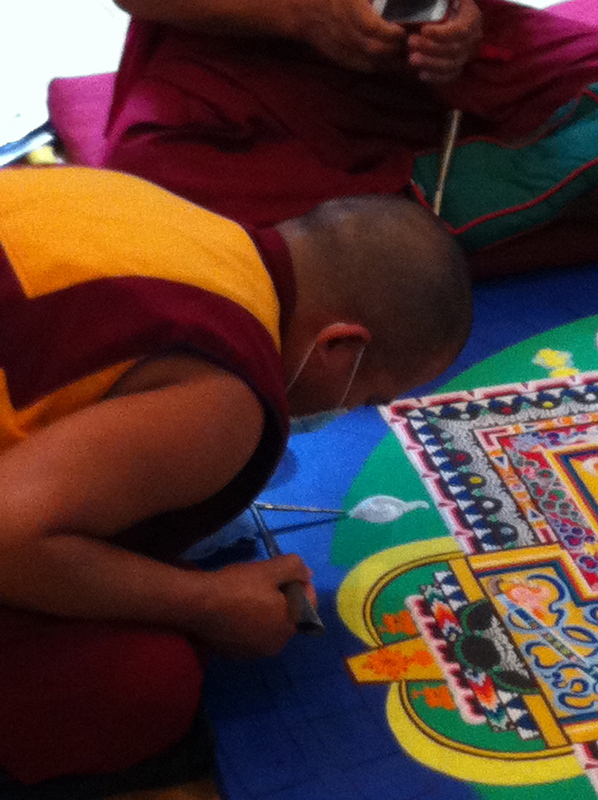 Tibetan Monks creating a Sand Mandala which will be washed away upon completion. These guys know about Process! As I completed my writing for that day I began to see how close to finishing the novel I was getting and it occurred to me that I was so focused on completing the book I wasn’t savoring the precious time spent writing. I don’t remember the date, but that day, that moment, brought about a subtle yet pivotal change in my thinking and thus my experience. Why not enjoy the process? It’s important to have goals. Goals provide inspiration and direction for our activities. Equally important is the ability to remain attentive to the process. When I become too focused on the outcome of a goal (be it a creative project, yoga pose, or personal achievement) whether I do or do not attain the goal, I’m often left with a feeling of disappointment; of emptiness and dissatisfaction. I think this is in part because I was too focused on result and not enough on process. To focus on process not only allows for the moment to moment engagement of all aspects of life, it also creates space for letting go of result. When we are able to balance inspiration and focus on a particular goal with attention and enjoyment of all the related and unrelated steps along the way, we lessen our attachment to outcome and increase our satisfaction with wherever we are. Ultimately this is the yoga of engagement and achievement, a dynamic dance between process and product that when realized gives rise to a deep feeling of meaning and satisfaction in life. I invite you take a moment and look at where in your life you may be too focused on a goal and less interested in process. A tell tale sign this is occurring is to notice the thought, “When I get XYZ complete, or When ABC happens, I’ll be happy, can relax, settle down, etc.” Conversely, you might also notice where in your life you feel stale, uninspired, lacking in direction. These may be signs that either you are no longer engaged in the process of daily living, or that you could use a little inspiration, a little goal to direct your energy. Whether you step into this practice of process through an at home meditation or asana sequence, a live yoga class, or a special workshop (perhaps the Get Vibrant Part II, happening this Friday evening from 6-8:30pm at Studio Vibe in which we will engage the process of opening the hips and balancing on our hands), take some time this week to engage the process of moment to moment and day to day living. _________________________________________________________________*Yes, I have been writing a novel. It’s called Presence the Dawn. After 3 drafts I now feel confident enough to begin the publication process by submitting to agents and publishers. If you have any contacts, please let me know!